“Yellow journalism” is an evocative sneer that has morphed over the decades. The term these days is sometimes invoked as an off-hand description for sensational treatment of the news. Or, more broadly, it’s used to describe egregious journalistic misconduct of almost any kind. But that’s really an imprecise characterization of a robust genre practiced by Hearst and others in the late 19th century. a penchant for self-promotion, to call attention frequently to the newspaper’s accomplishments. This tendency was notably evident in crusades against monopolies and municipal corruption. 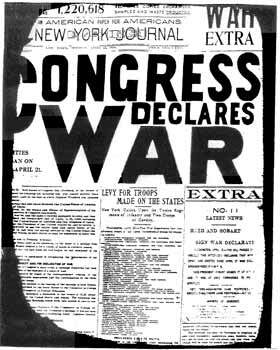 Moreover, yellow journalism of a century or more ago was often criticized–but its salient features, including its bold typography, were often emulated. As such, it exerted a powerful influence in American journalism of the late 19th and early 20th centuries. So it was much more than merely sensational. But largely due to its association with Hearst–a toxic personality who ran the New York Journal and later turned the newspaper into a platform for a succession of failed campaigns for high public office–“yellow journalism” has mutated into the caricature that’s commonplace today. As I discuss in Yellow Journalism, the epithet was devised in early 1897 to impugn the journalism of both Pulitzer and Hearst. The term appeared in Wardman’s newspaper on January 31, 1897, and quickly caught on, as a way to denigrate what then was called the “new journalism” of Hearst’s Journal and of Pulitzer‘s New York World. By the end of March 1897, references to “yellow journalism” had appeared in newspapers in Providence, Richmond, and San Francisco. A sneer thus had been born. Precisely how Wardman and the Press landed on “yellow journalism” is not clear, however. As I note in Yellow Journalism, the newspaper’s own brief discussion of the term’s origins was vague and unrevealing: “We called them Yellow because they are Yellow,” it said in 1898 about the Journal and the World. In the 1890s, the color yellow sometimes was associated with depraved literature, which may have been an inspiration to the Harvard-educated Wardman, who plainly despised Hearst and Pulitzer, and editorially supported an ill-fated boycott of their newspapers in New York City in 1897.